Some of the old recipes that have been passed down to me don't exactly have heart healthy in mind so occasionally I come across one that I can't resist trying to reinvent. This is one of those crossover recipes that was born out of inspiration and experimentation. The end goal is to match the flavor of the original while upping the level of nutrition by revamping the ingredients. This particular recipe is one of my favorites and a staple of my childhood. I started with my Nannie's Banana Nut Bread and began the process of swapping this and that. Here are some of the changes I made: swapped half of the flour for raw oats, swapped the oil from vegetable to coconut oil and cut the amount in half (I used yogurt to make up for some of the moisture), swapped most of the white sugar for brown sugar. These are not necessarily low calorie (240 cals each), just more health conscious. 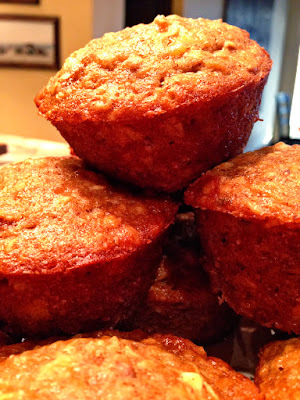 They are a fantastic breakfast muffin as the whole oats hold you over longer than plain white flour (which has virtually zero nutrition that fuels your body) but they also cure those late night sweet tooth cravings. I even made a batch of mini muffins that I can snack on here and there when I don't need a whole meal. A mini muffin for a mini-meal! Combine all ingredients in a bowl, mix well but do not beat. Spray muffin tins with cooking spray and fill muffin tins to just under the brim. Bake at 350 degrees for 20-25 minutes or until a wooden toothpick inserted into the center (of an inside muffin) comes out clean. Makes 20-24 regular muffins.